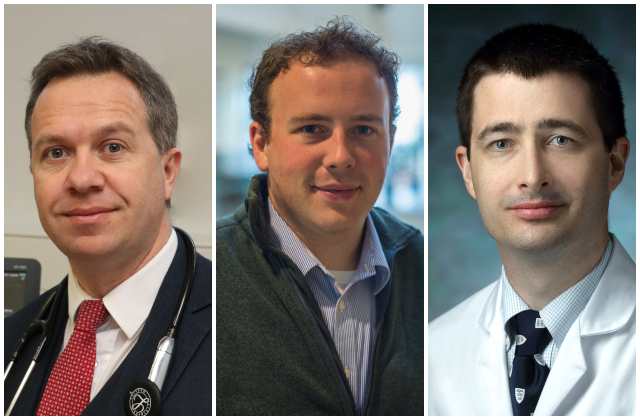 Three new Consultants were recently appointed to Galway University Hospitals (GUH): Prof Derek O’Keeffe, Consultant Endocrinologist; Dr Andrew Smyth, Consultant Physician; and Dr John William McEvoy, Consultant Physician. Dr Derek O’Keeffe, Professor of Medical Device Technology / Consultant Endocrinologist at Galway University Hospitals / NUI Galway. Consultant Endocrinologist, Prof Derek O’Keeffe holds a dual first class honours degrees in Engineering and Medicine as well as a Masters and PhD in Biomedical Engineering from the University of Limerick and NUI Galway. In addition he was awarded a first class honours Graduate Diploma in Clinical Education. He also studied at several international institutions including Oxford University (UK), the University of New South Wales (Australia) and Lomnosov University (Russia). He was a Fulbright Scholar at Harvard University (USA) and a graduate of the Endocrinology Clinical Fellowship at Mayo Clinic (USA). Prof O’Keeffe previously worked with NASA as a flight surgeon for their NEEMO mission and placing an astronaut health experiment on board the International Space Station. As well as multiple academic publications, he holds two biomedical patents and several international research prizes. He was awarded the Outstanding Young Person of the World by JCI. Dr Andrew Smyth, Associate Professor of Clinical Epidemiology / Consultant Physician at Galway University Hospitals / NUI Galway. Consultant Physician, Dr Andrew Smyth graduated from NUI Galway in 2006 with an Honours Degree in Medicine. Following the completion of his intern year at GUH, he pursued a career in internal medicine and completed basic training in 2009 at Mayo Clinic (USA) and GUH before completing Higher Specialist Training in Nephrology and General Internal Medicine with the RCPI. In 2011 he commenced the National SpR Academic Fellowship Programme which involved integrating a PhD in Medicine and Clinical Epidemiology and went on to complete research and clinical fellowships at McMaster University (Canada). Dr Smyth completed his PhD entitled ‘Diet and Renal Outcomes’ in 2015 and has published over 50 peer-reviewed articles. From September 2016 to August 2018 he was the first Irish recipient of a Wellcome Trust Postdoctoral Research Training Fellowship for Clinicians based at NUI Galway focusing on the epidemiology, predictors and treatments for people with chronic kidney disease. Dr John William (Bill) McEvoy, Associate Professor of Clinical Epidemiology / Consultant Physician at Galway University Hospitals / NUI Galway. After graduating from the UCC School of Medicine, Dr John William McEvoy undertook senior house officer and cardiology registrar training at the Mater Misericordiae University Hospital. In 2008 he joined the Osler Medical Housestaff at the Johns Hopkins Hospital and University School of Medicine (USA). After his internal medicine residency he completed his cardiology fellowship including advanced training in cardiac prevention, cardiac imaging, and cardiovascular epidemiology. He also served as Chief Cardiology Fellow at Hopkins. He received the Johns Hopkins Department of Medicine teaching award for fellows in 2013 and holds a Masters degree in cardiovascular epidemiology from the Johns Hopkins Bloomberg School of Public Health and a Masters degree in the education of health professionals from the Johns Hopkins School of Education. Prior to returning to Ireland in 2018, Dr McEvoy was an Assistant Professor on the cardiology faculty at Johns Hopkins for 3 years, with clinical roles in the cardiac intensive care unit and in the Ciccarone primary and secondary cardiovascular prevention centre. He is a Fellow of the Royal College of Physicians of Ireland and has a clinical interest in the primary and secondary prevention of cardiovascular disease in both critical care and outpatient settings. In addition to his role as Professor of Preventive Cardiology at NUI Galway, Dr McEvoy is the medical and research director of the National Institute for Preventive Cardiology.